CINCINNATI – There was no shortage of workers when employees from 19 local businesses gathered to work on seven community projects in Walnut Hills Friday. And no shortage of tools, either. 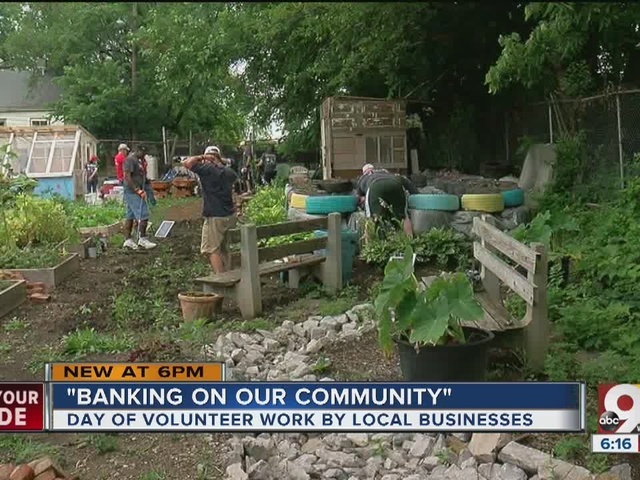 The Cincinnati Community Toolbank, a non-profit, equipped the workers for the third annual event, called "Banking on Our Community." "We have 218 different types of tools," said Kat Pepmeyer of the Toolbank. "We have a huge warehouse full of tools that we can loan out to different organizations so they can better equip their volunteers to take on larger and more frequent service projects, so it will increase their efforts in the community." In four years, the Toolbank has loaned tools to more than 100,000 charitable workers for various projects throughout the city. "You can see so many smiles because groups can get the projects done they have been wanting to do," Pepmeyer said. HEAR comments from workers and Pepmeyer in the video above.